What could possibly be better than getting to enjoy Prosciutto di Parma as an after-dinner treat? Red-Wine Poached Pear and Prosciutto Wedges are the only way to go if you’re hoping to wow every guest you entertain during the holiday season. The creamy mascarpone is the perfect match with the sweetness of pear and prosciutto, not to mention the added crunch from the pistachios. Both kids and adults alike will love this one-of-a-kind holiday dessert. Feeling extra festive? Be sure to pair these bites with a fantastic wine, such as a Bordeaux or even your favorite holiday spiced wine. This recipe comes from our Specialist retailer Providore Fine Foods in Portland, Oregon, and take a look at a how-to video from our Specialist retailer, Mariano’s Market. Heat medium non-stick skillet oil over medium-high heat and cook prosciutto until crispy; reserve. In saucepot combine wine, brown sugar, orange juice, cinnamon sticks and cloves and cook over medium heat until sugar is dissolved. Add pears and bring to a boil over medium-high heat. Reduce heat and simmer, uncovered, until pears are tender, 20-30 minutes, turning pears occasionally. 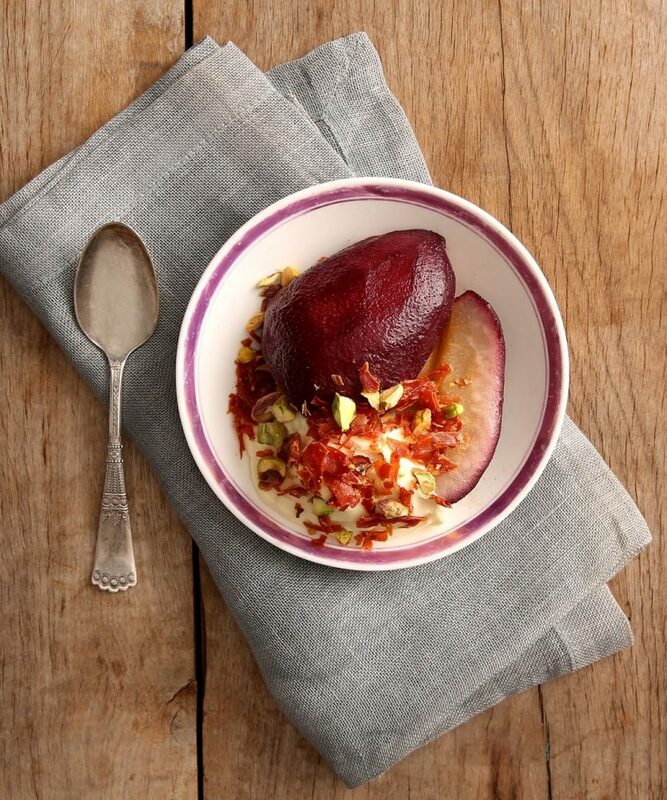 Using a slotted spoon, remove pears and set aside or refrigerate. Cook wine mixture until reduced to about 3/4 cup, about 20 minutes. Core and slice pears. Arrange pears on serving dish. Drizzle with some of the sauce and top with dollops of mascarpone, pistachios and crispy Prosciutto di Parma. Serve with remaining sauce.